Create greater organization and flexibility in your storage system with stack and nest containers and totes. Totes stack neatly out of the way when not in use and stack one on top of the other for product separation and organization. 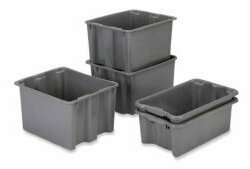 Stackable Plastic containers are for larger items that require greater storage space. These efficient, lightweight containers are manufactured from high-density polyethylene. designed for use in your general manufacturing, food processing and distribution applications. These rugged totes are resistant to the damaging effects of oil, most chemicals, solvents, water and steam for an extended service life in your facility. Resistant to rust, corrosion and temperatures ranging from 0 degrees F to 120 degrees F.
Easily cleanable and ideal for handling unpackaged product. No sharp edges, burrs or splinters. Maximum load capacity of 70 lbs. per tote, bottom container supports 300 lbs. stacked. Textured bottom on selected containers ensures compatibility with conveying equipment. Compatible with many racking and shelving styles. 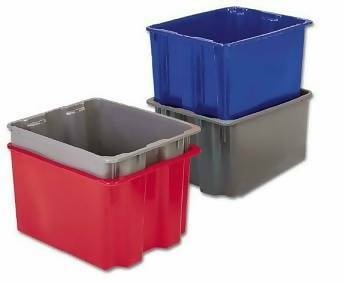 Durable matching Covers are available for selected containers to protect product from moisture, impact and contaminants. The CSN2012-1 is produced in polyethylene. All other covers are manufactured in polypropylene material. 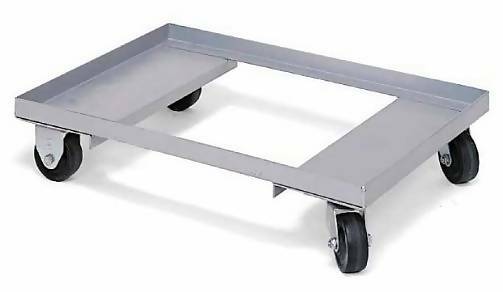 Heavy-duty dollies, with 560 lb. capacity, are available to move containers quickly, easily and safely. The dollies are chrome-painted and equipped with two swivel and two fixed 3" casters. Call for availability - Available in gray on a made to order basis!